Renowned Nollywood actor, Kayode Dosumu, well known as Pa Kasumu, is not in the best of health at the moment. The man is dejected and is fighting for survival at the Lagos University Teaching Hospital (LUTH), where he's receiving treatment. We learnt that he is being treated for heart related disease, which is affecting his sight and needs nothing less than N12million to undergo a full treatment to make him survive the battle with death. We also gathered from a report that efforts are now being made to save him from dying. The actor has been battling with re-occurring illness since 2009. Recall that in 2011, news went round that he reportedly suffered from stroke, but bounced back and was at the first edition of AfricaMagic Viewers Choice Awards held in Lagos in early 2013. Question of the Day! 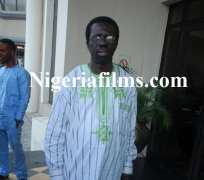 (Tunde Bakare) Do Pastor Collect bribes from Politician? Kemi Omololu Olunloyo:FaceBook DramaQueen At It Again!